Over the weekend the Union County Homicide Task Force charged an Elizabeth man with the death of a 92-year-old woman, announced Union County Prosecutor Theodore J. Romankow. 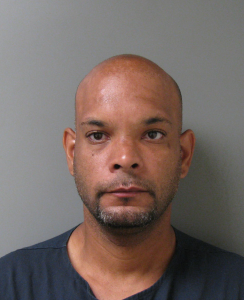 Daniel Rios DOB: 2/26/1974 of 1016 Adams Street in Elizabeth was charged with Felony Murder and Burglary in connection with the May 24, 2012 homicide of Annette Hemple. The victim was killed inside her Jefferson Avenue home Avenue in Elizabeth. She was last seen alive by a family member who lives on the second floor around in the early afternoon on May 24. When the family member returned a few hours later they found Ms. Hemple on the floor of the living room unresponsive, said Romankow. She was pronounced dead at the scene at 6:21p.m. Rios was charged while in the county jail, said Romankow. He was arrested earlier last week in Newark by the Homicide Task Force. Rios was identified as a suspect after an investigation by Elizabeth Police Department on burglaries in the area prior to the homicide. Based on the investigation it appears that Rios forced his way into Hemple’s residence, strangled her, and then stole loose change, said Romankow. He took the change to a local supermarket where he netted roughly $360. Judge Robert Mega signed the complaints against Rios and set his bail at $1.5 million. Rios is being held in the Union County Jail.